Every scene is divided into a logical grid of blocks (the "graph"). 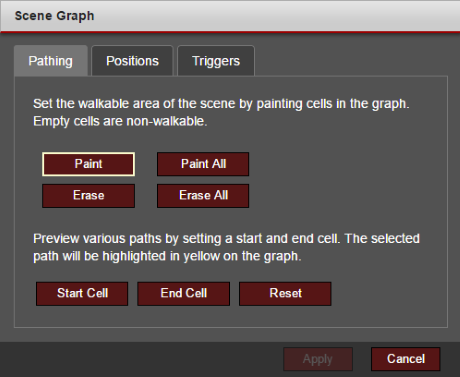 Upon opening the Scene Graph editor a grid will appear on top of the scene. This is your opportunity to set the "walkable" cells, which determines the pathing behavior of a scene. In order for a character to be placed in a scene, it needs a start position. Depending on the position's properties, the character may or may not be able to use it. See Start Positions for more details. Triggers are special areas of the graph that either change the scene (i.e. serve as an exit) or execute a script. The action is executed as soon as the active character walks into a trigger cell.